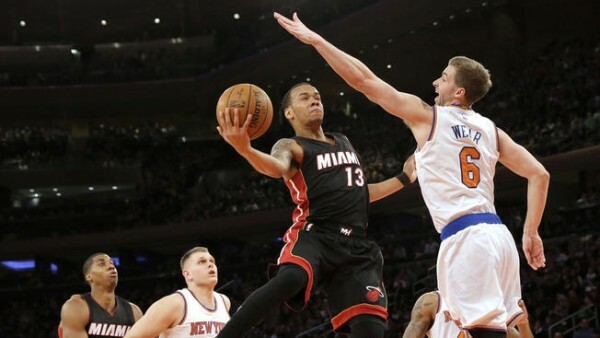 The New York Knicks are the worst team in the NBA, which made it very easy for the Miami Heat, playing without Chris Bosh or the newly acquired Goran Dragic, to pick up a much needed win in their attempt to keep their playoff hopes alive. Bosh is going to be out for a while, probably, due to a health scare involving a blood clot in his lungs. Not life threatening, but certainly serious enough to consider he might not be playing again this season. For a team that is quite short on inside power except for Hassan Whiteside, losing Bosh, their best player so far this season (when he’s healthy), doesn’t sound like something they can afford to happen in their attempt to cling to the 8th spot in the East. Without him or Dragic, traded from the Suns, it still didn’t take much to upend a Knicks team that has given up on this season or to try and please their fans from time to time as Carmelo Anthony has gotten shut down for the rest of the season. Eight Heat players scored in double figures, led by Shabazz Napier off the bench with 18 points. Dwyane Wade scored 12 points in only 22 minutes, Mario Chalmers added 13 with 6 rebounds, 7 assists and 8 steals; even Tyler Johnson had a good time, scoring 14 points off the bench. This win means nothing, not when the Knicks are plaing Lou Amundson, Jason Smith, Cleanthony Early, Jose Calderon and Langston Galloway in the starting lineup. The only sad thing for the Heat coming out of this game, which ended in a 111-87 win, improving to 23-30 this season? This was their third and final meeting with the Knicks this season. One less team that offers and almost guaranteed win on their schedule.